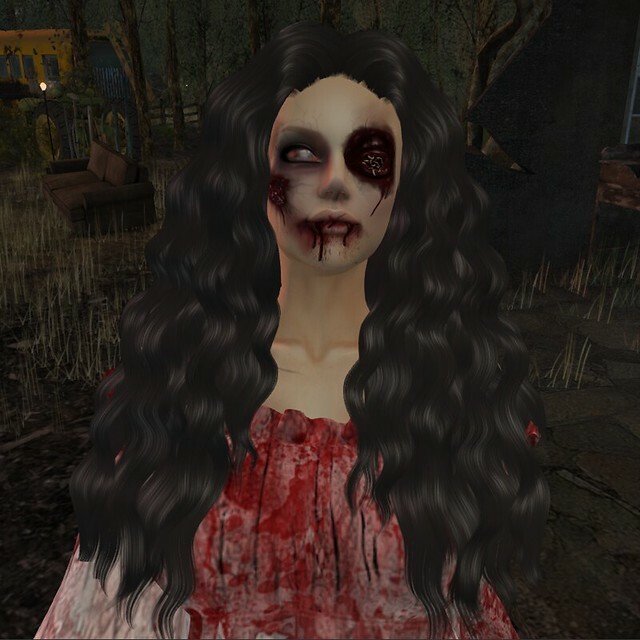 Thanks to a couple of great freebies, one each from Bossie and GothiCatz, we’ve assembled a chilling zombie look for you. WARNING: Not safe to wear this look around avatars named Rick Grimes, Daryl, or Michonne! Bossie’s October group gift is this lovely decaying skin and eye applier set. The appliers support Catwa, and Omega compatible mesh heads & bodies. Included in the set is a gory, rotting, maggot infested mesh eye that any avatar can wear. The creepy eye is definitely worth adding to your Halloween makeover tool chest. Classic avatars don’t despair. Though you can’t wear the Bossie appliers, you can still use the creepy mesh eye. And, we looked though the marketplace and put together several tattoo layers to help create your own zombie skin, plus we found a dead eyes freebie. You can see the classic look under the shoe picture. The bloody dress is from GothiCatz. It is sized to fit mesh and classic avatars, so everyone can commune with their inner zombie properly attired. Best of all, it’s free for all visitors to the store, no group join required. Sintiklia is also giving a great freebie this month to all store visitors. Feast your eyes on the Lioness hair. It’s a full fatpack, so you’re bound to find a color that appeals to your unique tastes. A quick trip to The Free Dove will supply these high mules. 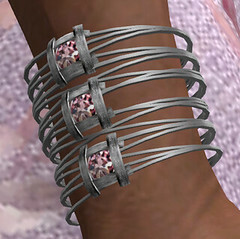 They are sized for Maitreya, Slink, and Belleza feet. Here’s our classic avatar version of today’s outfit. The key to getting looks like this from free makeup finds is layering the tattoos. 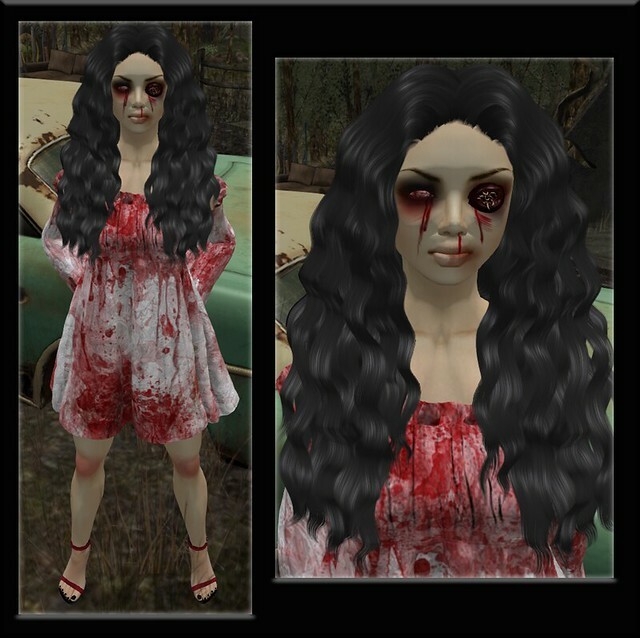 Apparition gives a fantastic set of skin tint tattoos in their marketplace store. The tints come in 4 strengths: 10%, 25%, 50%, and 75%. You choose the tint shades and and layer over your own skin. Or, you can wear the Zara skin gift from Corvus as your base to get the same look as our model. Everwinter is a post apocalyptic theme park. It’s super creepy, and perfect for a good scare.